Satirical News: President Nobita Made Object of Ridicule This Chinese New Year! The president's priceless reaction to criticisms! President Nobita got a visit from the Chinese Embassy this Chinese New Year. While attending the Chinese New Year's festivity, he was met with hostility by the Chinese consuls. He was asked whether or not he would apologize for the botched hostage situation launched by the late Rolando Murderza. He was also criticized for his mismanagement of the Special Armed Forces situation, how poorly equipped his military is compared to the Chinese Army. He was reminded that he will not be allowed to enter into China until his term is over. China's latest firecracker is now part of the Chinese New Year celebration! 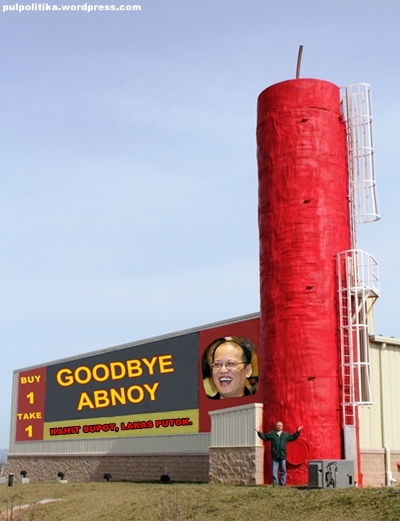 During the Chinese New Year celebration, members of the Chinese consulate introduced the latest firecracker called "Goodbye Abnoy". The Chinese New Year celebrations were done in China with "Goodbye Abnoys". Various firecrackers were also sold to Filipinos who were fed up with President Nobita's administration. China also berated President Nobita's music band called "No Direction". President Xi commented, "The band truly deserves its name. President Nobita is the reason why the Philippines has no direction." I have listened to its music and I can see why the Philippines is a failure. Our Communist government had learned from the mistakes done by Mao Zedong like overtaxation and economic protectionism. President Nobita has made everyone laugh during the APEC summit with his amazing stupidity!" Likewise, President Xi did not fail to mention President Nobita sending VP Jejemon Bitay to plead for the lives of the three drug mules. He said, "It's absurd how President Nobita thought he could teach us how to run our country. Those three drug mules Sally Villanueva, Elizabeth Batain and Ramon Credo fully knew our laws. They did the crime, they did the time. I offer no apologies to a country that made heroes out of those bozos. Why would I want those Chinese poachers back here? They would only repeat the crime here. Wow such logic it is to pardon a criminal just because he is a Filipino. Besides, all he does is blame Gloria Abobo for his mistakes, even when the previous administration had a better economic policy than his." As usual, Kris Aquino reacts and gets mad at the people ridiculing her brother. She was last seen throwing a tantrum.